Championship golf at the highest of levels often requires a willingness upon Mother Nature to cooperate. The U.S. Open, is predicated on firm and fast turf conditions. Getting the ball to run out after landing is an element that can confound the world’s best players because of the uncertainty it introduces. Compound that with the convex-shaped putting surfaces at Pinehurst #2 and the demands can jump enormously as the pressure of the championship builds each day. The United States Golf Association (USGA)—the sponsoring group—is fully aware that pushing the “dry” button to aggressively can result in what happened in 2004 at Shinnecock Hills when several of the greens simply wilted and balls were unable to stop with even the surest of strokes. The U.S. Open is neither a facsimile of putt-putt nor does the USGA want to endure again what blew up in their face at Shinnecock 10 years ago. However, the reverse can easily happen. North Carolina in June is often besieged by unpredictable thunderstorms—the intensity and rain provided can be quite heavy at times. Should Pinehurst #2 play soft and slow, the very defense of the course itself—the putting surfaces—will make for an entirely different event with low scores quite likely. In 2011 at Congressional, record scores were produced since the site was moist throughout the event. One also cannot forget the quagmire that happened at Bethpage Black in both ’02 and especially in ’09 when heavy rains simply drenched the course. Although the greens at Pinehurst average 5,600 square feet the effective landing area available to the players is half that. Legendary architect Donald Ross saw fit to defend the course through domed putting surfaces that will feed, even the slightest off approach shots, off the green. If the greens are firm the advantage will go the players best able to get into the proper position off the tee in order to have the appropriate angle. With firm targets—the players will need to skillfully land approaches to the right distance with the appropriate trajectory. Coming from the wrong side of the fairway can be the equivalent in landing a 747 aircraft on the deck of an aircraft carrier. Pinehurst #2, at its heart, is an approach-shot course. The players best able to consistently hit and hold the green complexes will likely be in the hunt and with a bit of success with the putter may likely hold the trophy after play concludes. This will be the first time the Men’s and Women’s Opens are played on the same course and on consecutive weeks. The USGA has said the move was done to accentuate the skills of women at the highest level and give their proper due. Why not have the women play first before the men as a number of LPGA players have stated? The USGA decided the men play prior to the women simply because of the inability to get greens to the favored speed levels—roughly 11.5 on the Stimpmeter. In sum—slowing greens down is easier than speeding them up. The possible complications go beyond green speeds. Weather may force the 72-hole Men’s Open to go to Monday should a tie occur. The USGA is the only major golf event requiring an 18-hole playoff to resolve ties. The competing women have been told they will have access to the course for practice play even if there’s a men’s playoff. The issue is further complicated should poor weather extend the event to Monday and a tie after four rounds of play happens—bumping the schedule back one additional day. Although the women were assured by USGA Executive Director Mike Davis all will flow well the bottom line is that all bets can quickly go out the window. Anyone who has witnessed a men’s professional event knows full well the wear and tear generated by their presence over a one-week period. Many courses in a host capacity need a few weeks—some even a few months—to get back to where they were prior to the event. Pinehurst #2, and more important, the grounds crew, will be tested thoroughly. The image of Phil Mickelson finishing second last year at Merion, for a record sixth time in the National Open, was difficult to endure—especially for Lefty himself. Fortunately, for him just one month later he celebrated joyously at Muirfield with the claret jug in winning The Open Championship—an event few people, Phil himself, thought likely given the paucity of top tier performances there. 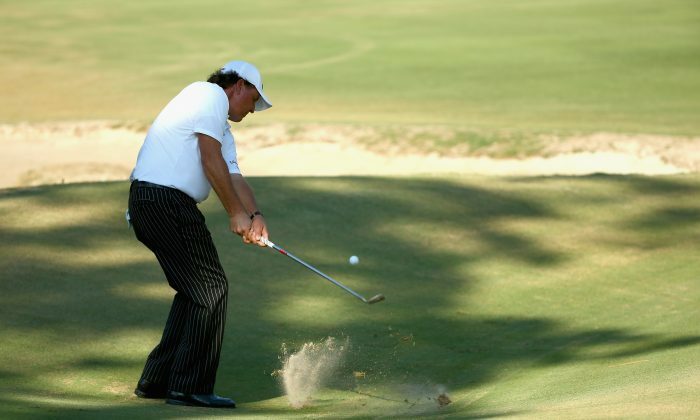 Mickelson finished 2nd at the U.S. Open for the first time in 1999, when Pinehurst #2 hosted its first U.S. Open. In that event winner Payne Stewart converted three successive one-putt greens in the final trio of holes— the most famous being his 15-foot par putt at the 72nd hole to win by one. Phil at age 43 is now in the twilight of his career. The 2014 golf season has been a disaster thus far. This past April he missed the cut for the first time at The Masters since 1997. Phil started the year in the #2 world ratings—he’s now 11th. There’s been no wins—not even a top ten finish thus far. Mickelson himself has stated he’s mentally “soft.” Playing in a U.S. Open requires a mentality far from “soft.” Does Lefty have one grand week left? A win would elevate him into the rarest of company with five other legends—players who have won all of the majors at least once in a career. Current form says otherwise. Mickelson has generally been anything but dull but the pressure on Phil to finally hold the U.S. Open trophy may be just beyond his reach. The desire to succeed at Pinehurst is further complicated by Phil having to discuss a stock trading probe by both the FBI and SEC—Mickelson has emphatically denied any wrongdoing since his name was mentioned. Can the Under-30 set Emerge at Pinehurst? When Rory McIlory won the U.S. Open in 2011 at Congressional with a record four-round performance the stage seemed ready for a young player of great promise to be the heir apparent to Tiger Woods. McIlory followed-up with a strong performance by winning the PGA Championship in 2012 but since that time his “promise” has stalled. A re-emergence by the 25-year-old at Pinehurst would do much to reassert his great promise. Jordan Spieth, nearly won The Masters this past April and The Players Championship a few weeks ago. The Texan is keen to assert himself at the ripe “old” age of 20—he doesn’t turn 21 till July 27. Patrick Reed at 23 has been no less a force winning three PGA Tour events since last August. Reed went boldly further when after winning earlier this year at Doral proclaimed he was among the top five players in the world. The issue is can Reed now contend in a major—that’s a hurdle he has not crossed, thus far. Jason Day (26), has been a steady contender in majors but failed to close the deal—although the super-talented Aussie won the Accenture World Match-Play event earlier this year. Webb Simpson (28) has already won a U.S. Open bagging the title in 2012 at The Olympic Club. Harris English (24) and Keegan Bradley (27) have also demonstrated the skills—English winning once in 2013 and again this year. Bradley winning the PGA Championship in 2011—but winless since 2012.